HP's already getting ready for the back-to-school season. 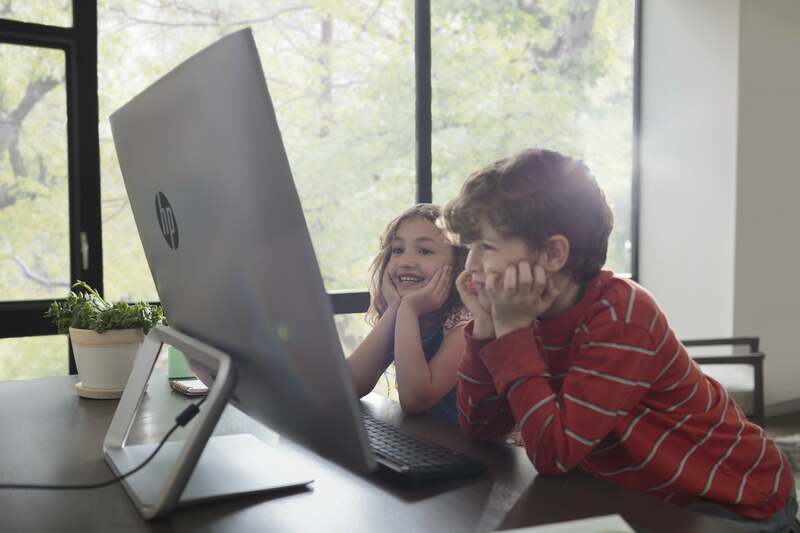 The school year isn’t even over yet, but HP's already gearing up for the back-to-school season this fall with a selection of new Windows 10 PCs. 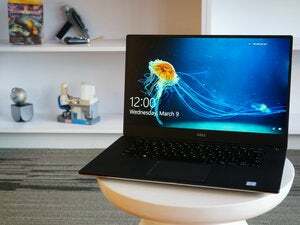 The company announced a number of new laptops, a new x360 convertible, a new desktop tower, and a snazzy looking 2560x1440 display as part of its new product blitz. 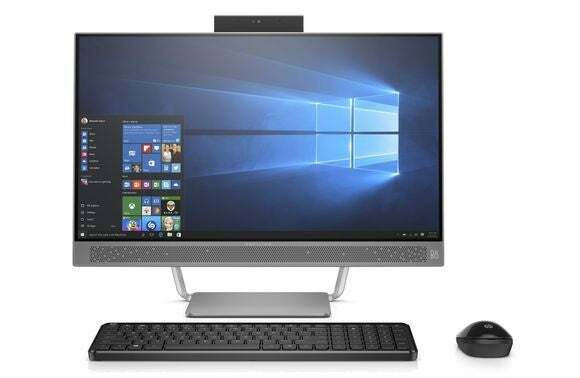 But what really caught our eye was HP's new Pavilion all-in-one with a “micro-edge display” offering 75 percent less bezel than a typical edge-to-edge display. The new AIO also has an option for a privacy-centric webcam that uses physical means to protect you even if your camera gets hacked. There are actually two new Pavilion AIOs: a 23.8-inch model and a 27-inch model. 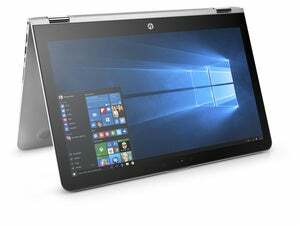 The former features the optional micro-edge display, which brings the bezel width down to a quarter of an inch compared to HP’s standard one-inch frame. HP also added a little more tilt to the micro-edge display option, allowing for a range between -5 and 25 degrees, while the non-micro bezel displays can only tilt between 0 and 25 degrees. The AIOs can come with either a 1920x1080 or 2560x1440 display, as well as touch and non-touch options. 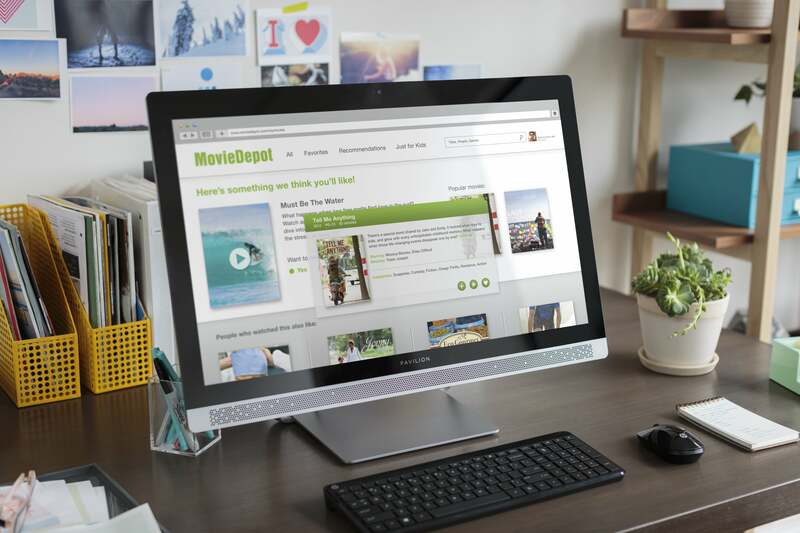 The new 27-inch AIO in action. Well, stock photo action. 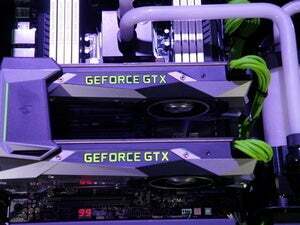 Diving inside the machines, the 23-inch standard model will come with a 2.9GHz dual-core AMD A9-9410, while the 27-inch offers a 2.2GHz quad-core Intel “Skylake” Core i5-6400T. HP says there are models that support up to a Skylake Core i7 for those who need more processing power. The new Pavilion all-in-ones also support up to 16GB of RAM, a 3TB hard drive, or a 1TB hybrid drive. The port selection's pretty standard. You get three USB 3.0 ports (one on the front, two on the back), but only one is Type C—although it does support fast charging. The new AIOs also offer another two USB 2.0 ports, HDMI out, microphone-headphone combo jack, and a 3-in-1 media card reader. What’s really smart about this AIO is the new HP Privacy Camera. Instead of having the unseeing eye of your AIO always staring at you, it pops out from the top of the display using a spring. When the camera's hiding inside the enclosure, the camera and mic are disabled. It's an interesting feature since privacy experts have long asked PC makers to create a way to physically block a webcam when not in use. Like anything else on your PC, webcams can be hacked, allowing malicious types to spy on your private doings. Hiding the camera when not in use should offer some modicum of privacy for a hacked PC; however, it’s not clear if bad actors could reactivate the microphone even when it’s hidden from view. The impact on you at home: Overall, if you’re looking for a nice AIO for school or work the new Pavilion models could be a solid choice. The new lineup will roll out to select retailers in July—the 23-inch rolls out on the 3rd, with the 27-inch debuting a week later on the 10th. Prices start at $700 for the smaller AIO, and the larger display version starts at $1,000.